This summer was full of firsts for the Backstreet Boys, but perhaps none as different for the group as what they’ve been doing in the world of country music. Not only did they release a single with another artist for the first time in their history, but the single was also a country song that climbed to #1 on country radio play. The music video for “God, Your Mama, and Me” has also hit over 23 million views on YouTube since its release in February. To say that the Backstreet Boys are having a great summer would be an understatement (and we’re not even adding in that Vegas show magic), so when CMT aired CMT Crossroads last night featuring the Backstreet Boys and Florida Georgia Line, it seemed to be the perfect culmination of everything that has made 2017 a spectacular year. Again, another first – their episode of CMT Crossroads was the first time the show featured two groups who already had a hit single together prior to taping. SPOILER ALERT: The Backstreet Boys and Florida Georgia Line know how to put on a show! Singing nine hits altogether – “H.O.L.Y”, “Cruise”, “I Want It That Way”, and “Everybody (Backstreet’s Back)” to name a few – the seven men blended vocals effortlessly and sang their way through like they’d been doing this as a mega group for years. 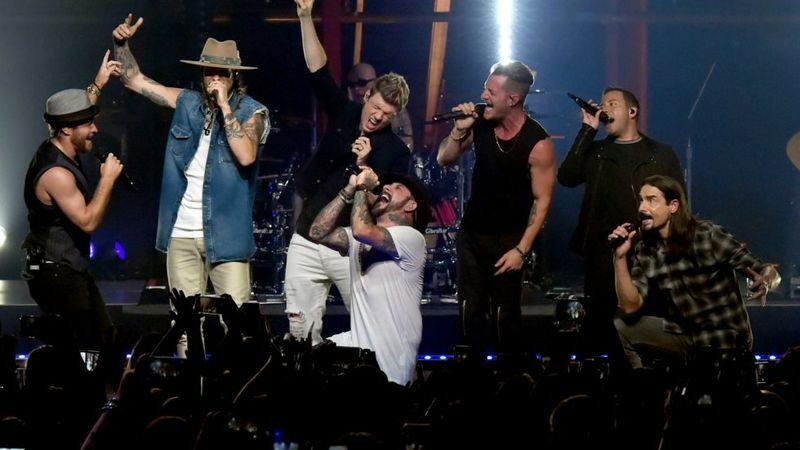 Segments between performances showcased just how similar FGL and BSB are – both not being immediately accepted by their genres and both being fans of each other. Florida Georgia Line were also inspired by the Boys, with Brian Kelley admitting that BSB was his first concert and an early CD purchase for Tyler Hubbard. But it’s not just their music that inspires Florida Georgia Line. "These guys are professionals, they take their job really serious and they also take their relationships with each other really serious," Hubbard told Rolling Stone back in February. While AJ spilled in a recent interview with Entertainment Tonight that the Boys are looking to acts like The Chainsmokers, Diplo, Zedd and Steve Aoki, we can only hope that their Florida Georgia Line relationship continues on for the Backstreet Boys 10th studio album as well. If you missed the episode, you can now watch it on CMT On Demand, online, or by downloading the CMT app on your mobile device!